These Barbacoa Beef Taco Bowls are everything!!! 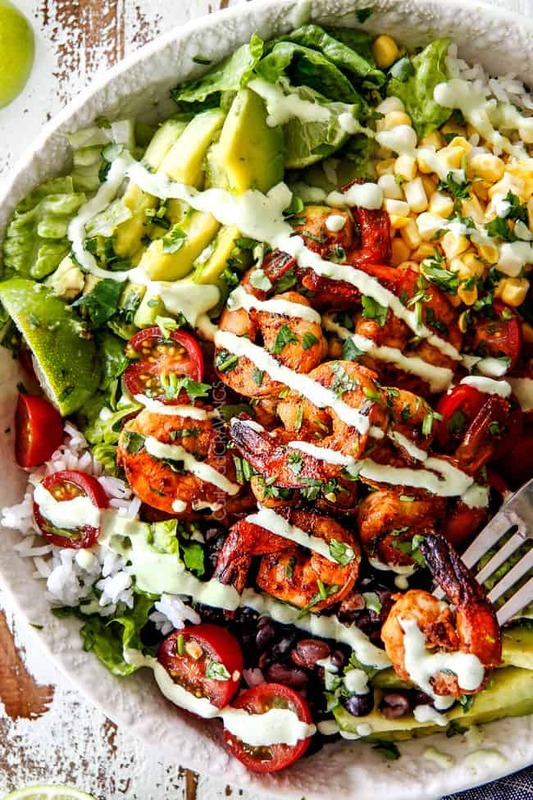 They are an explosion of flavor and texture in every juicy, crispy bite and make a fabulous prep ahead dinner or Game Day favorite – do I hear taco bowl bar?! Your family and friends will love to customize their taco bowls and you will loooooove how easy they are! 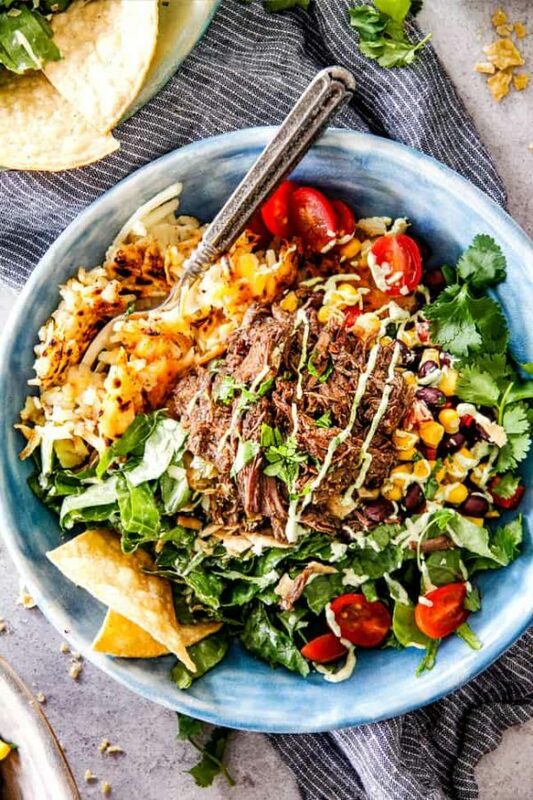 These Barbacoa Beef Taco Bowls are bursting with juicy, rich, spicy (customiazble), Barbacoa Beef, cheesy hash browns (droooooooool), crispy lettuce, a medley of crunchy bell peppers, warm black beans, and cilantro corn all drizzled with tangy Avocado Ranch and showered with crunchy tortilla chips! 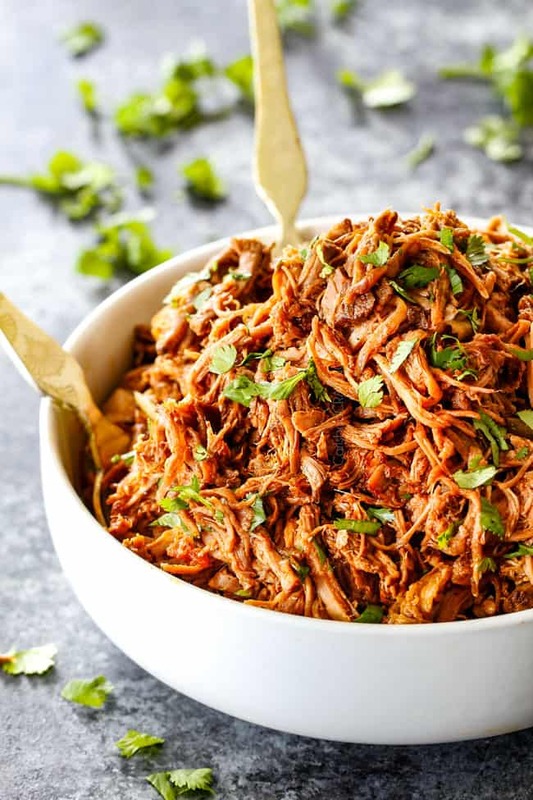 I just posted my Slow Cooker Beef Barbacoa and I’ve already been showered with comments on my FB saying the Barbacoa Beef was a hit and a particular favorite comment read, “Rarely do foods taste as good as they look. I made this last night and it was wonderful. Thank you for the recipe! It will be made many more times.” – thank you Amanda, you have great taste! So in case you are wondering if you should make my Crockpot Barbacoa Beef recipe, the answer is YES! And you should make my Barbacoa Beef Enchiladas AND these Barbacoa Beef Taco Bowls because melt-in-your-mouth tender, tangy chipotle beef + taco fixins’ = irresistible. 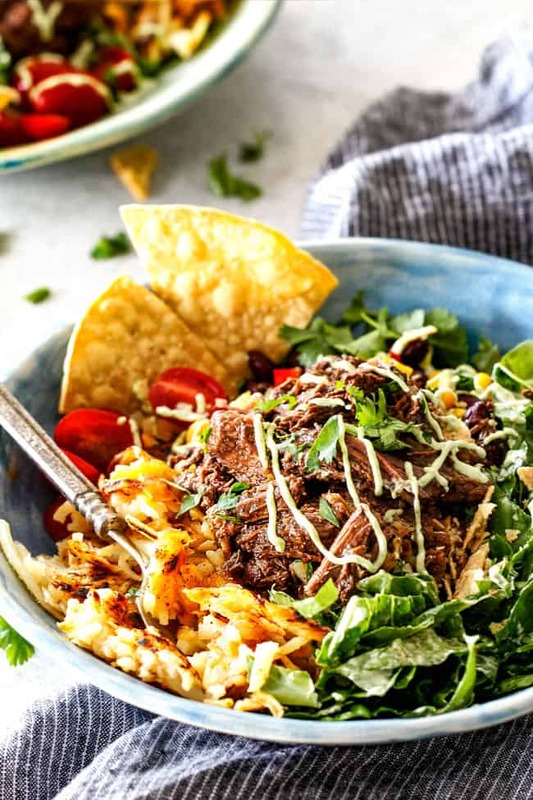 To make these Barbacoa Beef Taco Bowls, we first start by making our easy Slow Cooker Barbaco Beef. While the beef is bathing in the intensely flavored slow cooker bath, you prep all your taco bowl recipe ingredients. I love that! So when it’s dinner time, all that’s left to do is assemble the taco bowls – or better yet, let every diner assemble their own bowls so all that’s left to do is eat! For the Beef Taco Bowl fixins, we start out with cheesy hash browns. You can substitute rice if you prefer (my Cilantro Lime Rice would be amazing) but both Patrick and I were drooling over the meat/cheese/potato combo. The hash browns are a nod to California Carne Asada Burritos which are a staple here in San Diego and particularly in our little family. 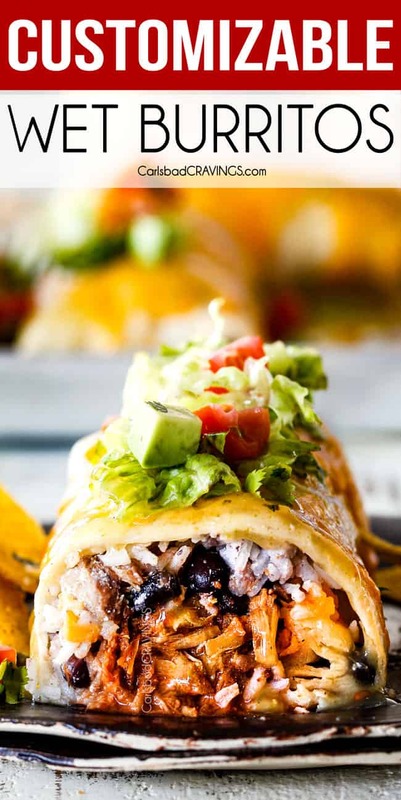 Basically, Carne Asada Burritos are your favorite carne asada burritos stuffed with French fries! Can I hug the genius who came up with that?! Because really, there is just something heavenly about meat and potatoes together. And if you thought French fries and steak were delicious, I can’t wait for you to sink your teeth into juicy Barbacoa Beef and crispy, cheesy hash browns! 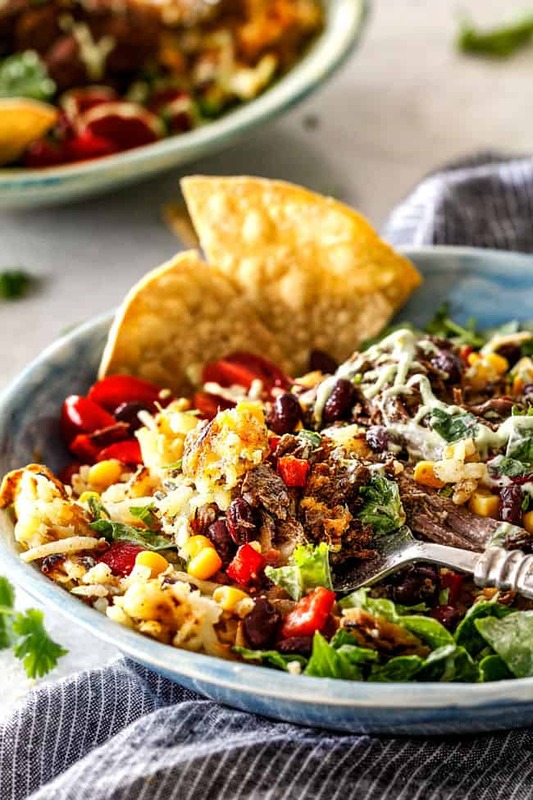 Our Barbacoa Beef Taco Bowls also boast a sauteed medley of black beans, red bell peppers and sweet corn which are tossed with a splash of lime juice and cilantro as well as ground cumin, salt and garlic. Delectable all on their own. The Barbacoa Beef Taco Bowls are finished with fresh, crunchy lettuce, plenty of crispy crushed tortilla chips and the crowning Avocado Ranch! Its luxuriously creamy, tangy and lick the blender delicious. Pile all those yummy layers together and you have Barbacoa Beef Taco Bowls. A new level of yummilicous! 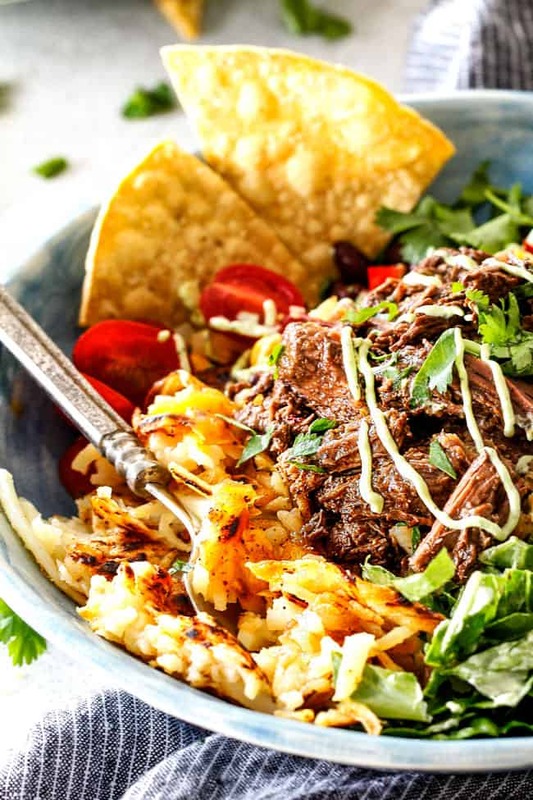 Want to try these Barbacoa Beef California Taco Bowls? Pin them to your MEXICAN, SLOW COOKER, BEEF or DINNER Board to SAVE for later! Looking for More Taco Recipes? 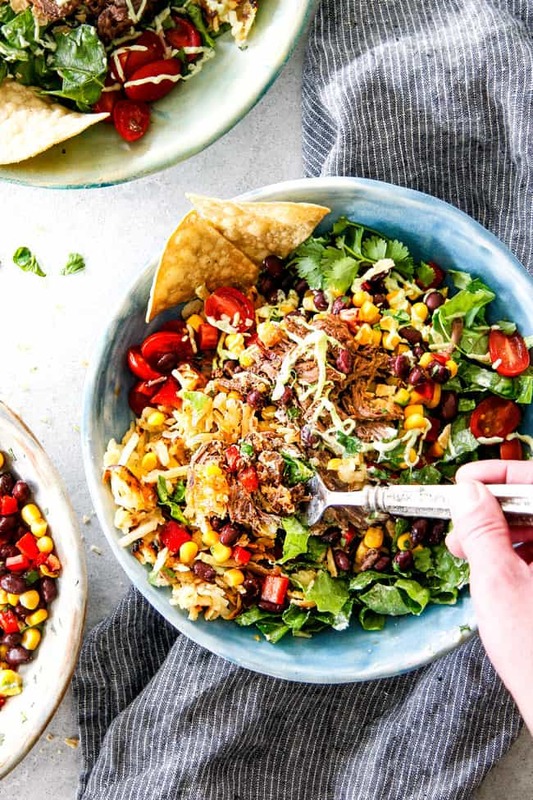 These Barbacoa Beef Taco Bowls are an explosion of flavor and texture in every juicy, crispy bite and make a fabulous prep ahead dinner or Game Day favorite - do I hear taco bowl bar?! Prepare Barbacoa Beef according to directions. You will not use all of the meat for this recipe. 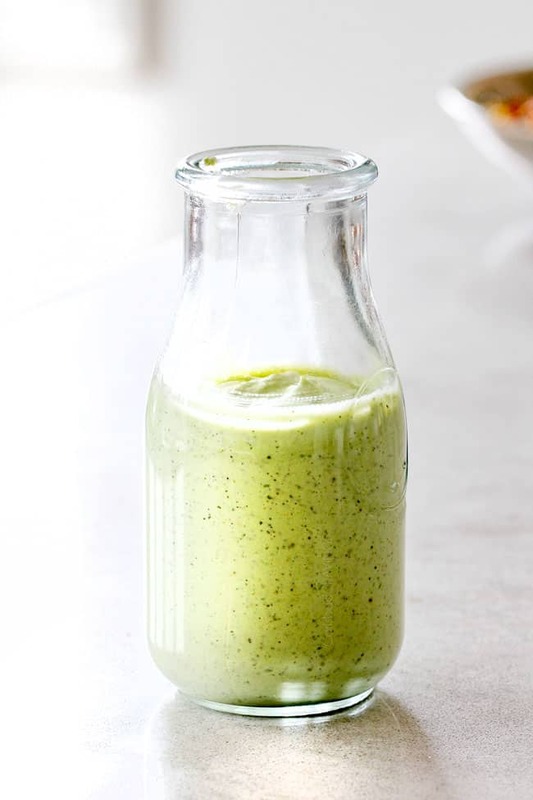 Meanwhile, add all of the Avocado Ranch ingredients to a blender and "chop" then puree until smooth, scraping sides down as needed. Add additional milk, a tablespoon at a time to reach desired consistency. Chill before serving. (Skillet is Optional: you can also serve cold) Heat 1/2 tablespoon olive in a 12” nonstick skillet with sides over medium high heat. 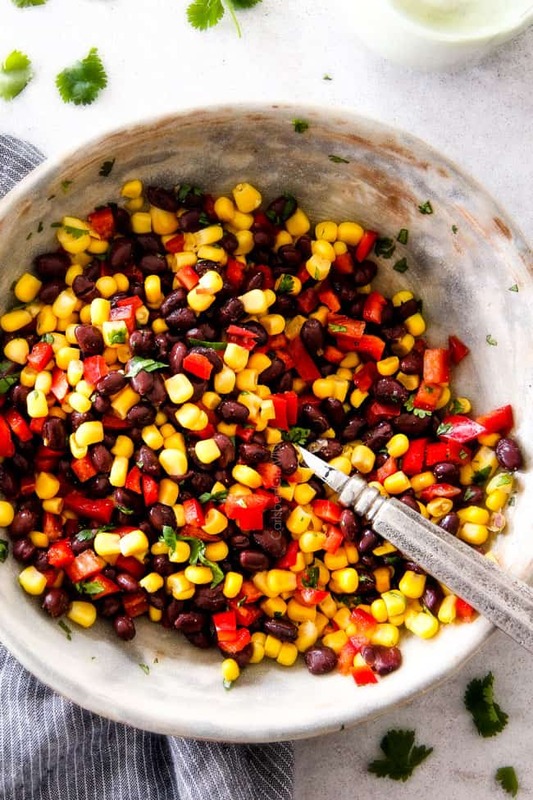 Add black beans, red bell peppers, corn, cumin, garlic powder and salt. Sauté 1-2 minutes, just to heat through. Transfer to a bowl and stir in lime juice and cilantro. Set aside. To the same nonstick skillet, heat 3 tablespoons vegetable oil over medium heat. Add hash browns and press into an even layer with the back of a spatula. Sprinkle evenly with 1/2 teaspoon chili powder. Cook, without stirring for 6-8 minutes, or until the bottom is golden. Turn over hash browns, press down with spatula, and sprinkle evenly with 1 cup cheese. Cook an additional 6-8 minutes, until golden and crisp. Cover the hash browns the last couple minutes if the cheese hasn’t fully melted. Evenly divide hash browns between 4-6 bowls. Top evenly with beef, black bean mixture, lettuce, tomatoes and plenty of crushed tortilla chips. Drizzle with Avocado Ranch. Serve with hot sauce and additional cilantro if desired. *If you can't find a package with with garlic, onion, salt and pepper then lightly season with garlic powder, onion powder, salt and pepper. 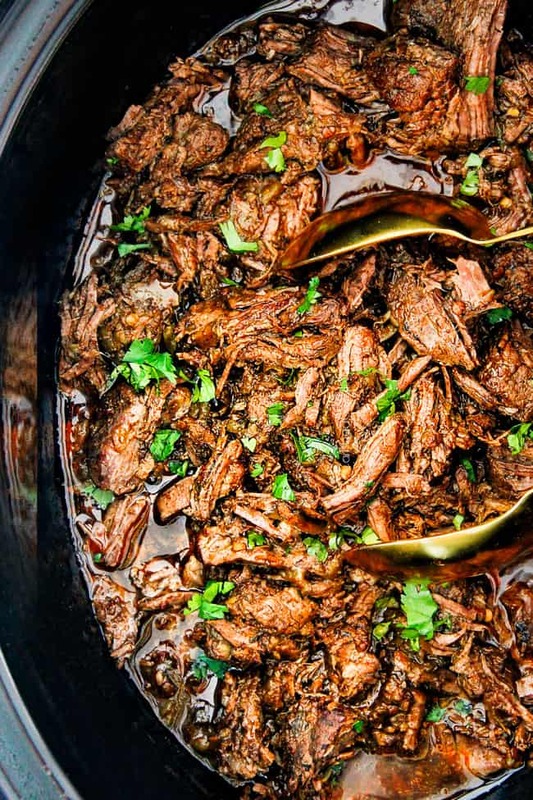 I made your Barbacoa Beef on Sunday and my whole family raved about it! Next time – in the very near future- I will make the taco bowls with the beef. I know my family will go crazy over the hash browns! That is awesome you made the Barbacoa Beef already! I’m so happy it was a hit with the whole fam, thank you! I am excited for you to make the beef with the bowls – I agree – your family will love the hash browns – a match made in heaven! This is such a cool combination of ingredients. Many of the bowl recipes out there end up being variations on a salad. They still have their place but what you have here looks even more amazing. Thank you so much Vince! I love a salad that is mostly NOT salad- haha – so these hit the spot! So surprised by the hash browns! Loved it! LOL! I figure we put French Fries in California Burritos so why not hash browns in a bowl? 🙂 I’m so happy you loved it! Will the avocado ranch hold up for leftovers? Maybe 3 to 5 days or will it brown? Thanks – looks delicious! Hi Denise! Yes, it can hold up for at least 3 days. It discolors only a little bit on the outside and when you stir it, it becomes brighter again. I hope that helps! Jen, we made the beef in the slow cooker and the house was filled with wonderful aromas. My husband loved the Taco Bowl!!!! Today for my lunch at work, I’m having that delish beef on a burger bun. We love your ideas! Keep ‘um coming! YAY! I’m so happy the taco bowls were a hit and they also sound fabulous as a sandwich! I’ll definitely keep the recipes coming 🙂 thanks for making them!